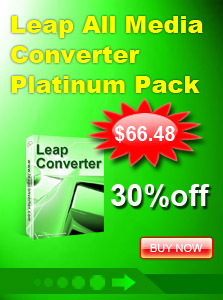 Leap DVD Ripper Platinum provides a fast and easy way to convert your DVD movies or just the parts of the movie that you want to your computer. It rips DVD in high quality to AVI, MP4, WMV, VCD, SVCD, DVD, 3GP, iPod, iPhone, Zune, Xbox, PMP, PSP, Apple TV, Pocket PC, FLV, SWF, HD and MOV formats. It also extracts audio tracks from DVD movies to MP3, AAC, AMR, M4A, OGG, and WAV. 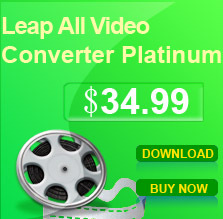 With Leap DVD Ripper Platinum, you can watch your DVD movies on your computer, iPod, MP4, iPhone, Zune, Mobile phone, PSP pocket devices on vacation, at work or at school, no need to take DVD discs! Output formats: AVI, MP4, WMV, VCD, SVCD, DVD, 3GP, iPod, HD, iPhone, Zune, Xbox, PMP, PSP, Apple TV, Pocket PC, FLV, SWF, and MOV video. Output formats: MP3, AAC, AMR, M4A, OGG, and WAV audio.